Yesterday, Blizzard has started newest seasonal event in their FPS game, Overwatch Anniversary event. They presented lots of new stuff as well as a return of the old brawls and skins. Blizzard began the celebration of the 2nd Overwatch Anniversary. As in the previous year, we will be able to see new cosmetic like skins, emotes, sprays or voice lines. However, the biggest difference is the return of brawls and skins from previous events! Every player will have a chance to get legendary skins they didn’t have earned previously. With all cosmetics, everyone will have another chance to play Lucioball, Junkenstein Revenge, Insurrection, Retribution, Mei’s Snowball Offensive and Yeti Hunt brawl. 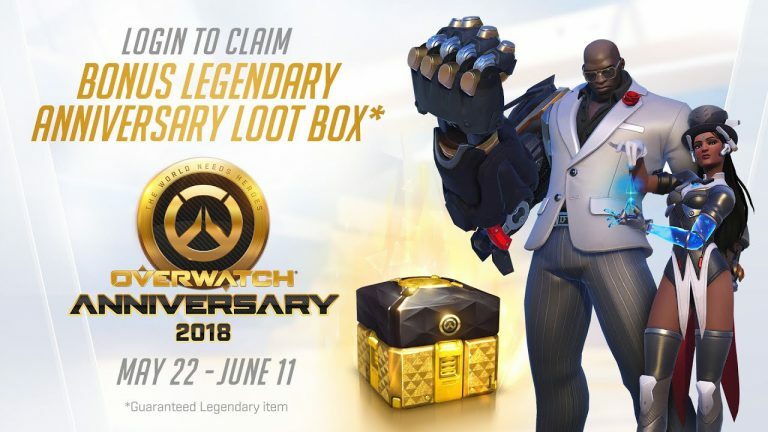 purchasing 50 standard anniversary loot boxes – you will get one legendary loot box. In this way, Blizzard wants to celebrate the trust the players have given to them. In the last days, Blizzard presented information about the success of the Overwatch League brand and presented the game sales results, which have already reached over 40 million players. In addition, the game has a new map prepared for the Deathmatch mode – Petra. A map is a place of ancient excavations located in today’s Jordan. Along with the new map, the competitive mode for Deathmatch was also launched. If you don’t want to play in a team, try your skill along with other players to be the “One man apocalypse”. For those who don’t have Overwatch yet, there’s large discount at Blizzard Store. You can buy Overwatch with 35-50% discount.